This event looks like a lot of fun. Those of you in the NYC-area should definitely check it out! Bad at Sports’ own Tom Sanford has a painting entered in the fray, which is reason enough to brave the chill. THE BATTLE OF THE BRUSH isÂ a group show of paintings organized and curated by Alex Glauber.Â Tom tells us there will be a reception, and though willÂ be cold in the park, there will be hot coco and heat lamps provided. OPENING RECEPTION (with heat lamps and lots of hot chocolate) THURSDAY JANUARY 20th 6-8PM on the Southwest porch on the 6TH Avenue side of the park. 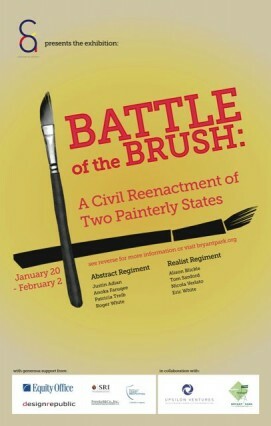 Corporate Art Solutions in collaboration with Bryant Park and Upsilon Ventures is pleased to present â€œBattle of the Brush: A Civil Reenactment of Two Painterly States,â€ a contemporary painting face off between realism and abstraction on view in Bryant Park from January 20th â€“ February 2nd. Utilizing the existing template of Upsilon Venturesâ€™ kiosks from The Holiday Shops at Bryant Park, two of the booths will be retrofitted with the help of painting conservators into temporary climate-controlled exhibition vitrines. These vitrines will be used to exhibit paintings for the first time ever in Bryant Park and in the process reveal how public art can be innovated through the creative adaptation of existing resources. In an attempt to playfully reconsider the historic painterly debate between realism and abstraction, â€œBattle of the Brush: A Civil Reenactment of Two Painterly Statesâ€ draws upon Bryant Parkâ€™s history as an encampment for soldiers during the Civil War. In using this little known historical fact about Bryant Park as a conceptual theme, the exhibition takes a tongue-in-cheek look at how one of the painting communityâ€™s most persistent antagonists in the 20th century was itself; specifically, the aesthetic and ideological divide between realist and abstract painters. More than just a question of style, this polemic has historically symbolized the tension between tradition and innovation. One such example was the boycott of the Metropolitan Museumâ€™s 1950 exhibition titled â€œAmerican Painting Today â€“ 1950â€ by eighteen abstract painters who claimed the showâ€™s jury was â€œhostile to advanced art.â€ Their ardent opposition earned them the name â€˜Irascible Eighteen.â€™ These days, we are much more civil than irascible. Therefore in the same way that Civil War Reenactors come together to imitate a moment in history when they stood apart, so too does this exhibition in order to reveal some of the more interesting directions realism and abstraction are being taken today.